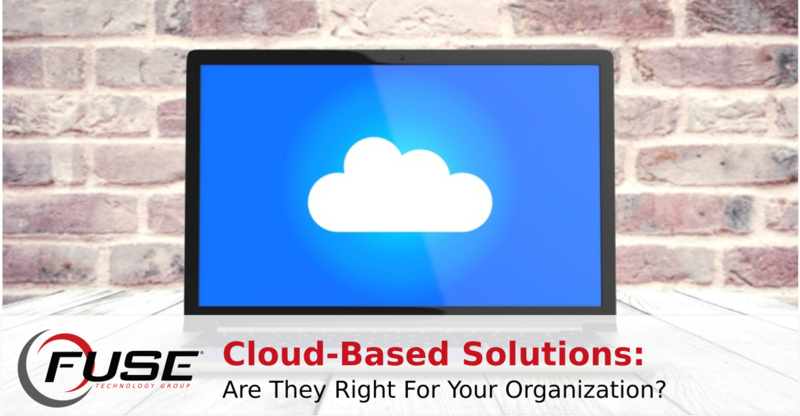 Fuse Technology Group | Are Cloud-Based Solutions Right For Your Organization? You’d be hard-pressed to find a business these days that doesn’t use the cloud in some way or another. Before investing in the right cloud solutions, it’s important that your organization considers several factors. If you’re trying to determine which cloud solution you’ll be implementing, the number one thing to consider is if it’s going to be a public, private, or hybrid cloud solution. Public clouds are generally hosted off-site on a third-party provider’s infrastructure, but a private cloud is more focused on hosting the service in-house on your organization’s infrastructure. A hybrid solution is typically a solution that is hosted on another organization’s infrastructure, but still offers a level of control that you don’t have with the public cloud. Depending on your business’ needs, a public cloud solution might not be enough. For example, a public cloud’s storage space might be partitioned off so that only you can access your storage space, but it’s still hosted on the same infrastructure as someone else’s, which might make some organizations shy away from it. If your business would rather have its own private storage or private cloud, hosting on your own hardware is the way to go–or working with a MSP to make it happen in a hybrid environment. When you want to go to a different website (or run something through a search engine), you have to type something in the address bar at This is incredibly important to know, especially if your business isn’t the one hosting the solution. You should know what expectations there are on your end of the dealings with your cloud provider. An example of this is if you’re getting your cloud storage through a third-party provider. While they are the ones responsible for hosting it, you’re the one responsible for accessing it. This includes having workstations and an Internet connection with enough bandwidth to make full use of your new solution or service. After all, if your business is using solutions that it can’t reliably access, it’s time to reevaluate your options so that downtime isn’t ruining your bottom line.